Right now you can get a huge sample pack from Ulta if you purchase anything from their site, over $25! And there is a code for 20% off any one item. Use code 46537. Only one coupon code can be used per order. 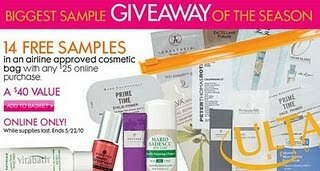 Don't forget that you get to choose 3 free samples with every order. Have fun shopping!! !